How Do We Recognize Depositional Environments? 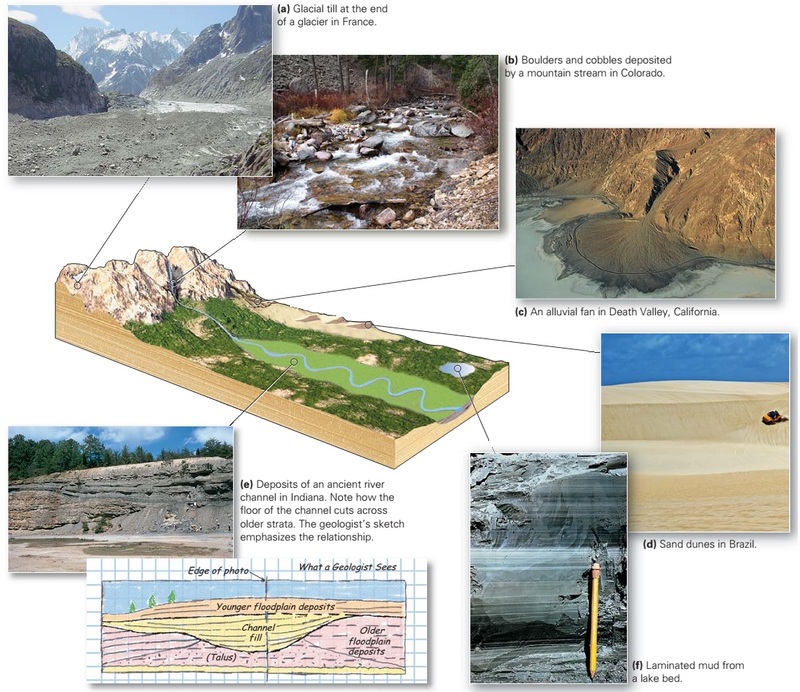 Geologists refer to the conditions in which sediment was deposited as the depositional environment. Examples include beach, glacial, and river environments. To identify depositional environments, geologists, like crime scene investigators, look for clues. Detectives may seek ﬁngerprints and bloodstains to identify a culprit. Geologists examine grain size, composition, sorting, bed-surface marks, cross bedding, and fossils to identify a depositional environment. Geological clues can tell us if the sediment was deposited by ice, strong currents, waves, or quiet water, and in some cases can provide insight into the climate at the time of deposition. With experience, geologists can examine a succession of beds and determine if it accumulated on a river ﬂoodplain, along a beach, in shallow water just offshore, or on the deep ocean ﬂoor. Let’s now explore some examples of different depositional environments and the sediments deposited in them, by imagining that we are taking a journey from the mountains to the sea, examining sediments as we go. We will see that geologists distinguish among three basic categories of depositional environments: terrestrial, coastal, and marine. We begin our exploration with terrestrial depositional environments, those that develop inland, far enough away from the shoreline that they are not affected by ocean tides and waves. The sediments settle on dry land, or under and adjacent to freshwater. In some settings, oxygen in surface water or groundwater reacts with iron to produce rust-like iron-oxide minerals in terrestrial sediments, which give the sediment an overall reddish hue. Strata with this hue are informally called redbeds. High in the mountains, where it’s so cold that more snow collects in the winter than melts away, glaciers rivers or sheets of ice develop and slowly ﬂow. Because ice is a solid, it can move sediment of any size. So as a glacier moves down a valley in the mountains, it carries along all the sediment that falls on its surface from adjacent cliffs or gets plucked from the ground at its base or sides. At the end of the glacier, where the ice ﬁnally melts away, the sediment that had been in or on the ice accumulates as “glacial till” (a in figure above). Till is unsorted and unstratiﬁed it contains clasts ranging from clay size to boulder size all mixed together. As we walk down beyond the end of the glacier, we enter a realm where turbulent streams rush downslope in steep-sided valleys. This fast-moving water has the power to carry large clasts; in fact, during ﬂoods, boulders and cobbles can tumble down the stream bed. Between ﬂoods, when water ﬂow slows, the largest clasts settle out to form gravel and boulder beds, while the stream carries ﬁner sediments like sand and mud farther downstream (b in figure above). Sedimentary deposits of a mountain stream would, therefore, include breccia and conglomerate. Our journey now takes us to the mountain front, where the fast-moving stream empties onto a plain. In arid regions, where there is not enough water for the stream to ﬂow continuously, the stream deposits its load of sediment near the mountain front, producing a wedge-shaped apron of gravel and sand called an alluvial fan (c in figure above). Deposition takes place here because when the stream pours from a canyon mouth and spreads out over a broader region, friction with the ground causes the water to slow down, and slow-moving water does not have the power to move coarse sediment. The sand here still contains feldspar grains, for these have not yet weathered into clay. Alluvial-fan sediments become arkose and conglomerate. If the climate is very dry, few plants can grow and the ground surface lies exposed. Strong winds can move dust and sand. The dust gets carried away, and the resulting well-sorted sand can accumulate in dunes. Thus, thick layers of well-sorted sandstone, in which we can ﬁnd large cross beds, are relicts of desert sand-dune environments (d in figure above). In climates where streams ﬂow, we ﬁnd several distinctive depositional environments. Rivers transport gravel, sand, silt, and mud. The coarser sediments tumble along the bed in the river’s channel and collect in cross-bedded, rippled layers while the ﬁner sediments drift along, suspended in the water. This ﬁne sediment settles out along the banks of the river, or on the ﬂoodplain, the ﬂat land on either side of the river that is covered with water only during ﬂoods. On the ﬂoodplain, mud layers dry out between ﬂoods, leading to the formation of mud cracks. River sediments lithify to form sandstone, siltstone, and shale. Typically, the coarser sediments of channels are surrounded by layers of ﬁne-grained ﬂoodplain deposits, so in cross section, the channel has a lens-like shape (e in figure above). Geologists commonly refer to river deposits as ﬂuvial sediments, from the Latin word ﬂuvius, for river. In temperate climates, where water remains at the surface throughout the year, lakes form. In lakes, the relatively quiet water can’t move coarse sediment; any coarse sediment brought into the lake by a stream settles out at the stream’s outlet. Only ﬁne clay makes it out into the centre of the lake, where it settles to form mud on the lake bed. Thus, lake sediments typically consist of ﬁnely laminated shale (f in figure above). At the mouths of streams that empty into lakes, small deltas may form. A delta is a wedge of sediment that accumulates where moving water enters standing water. Deltas were so named because the map shape of some deltas resembles the Greek letter delta ($), as we discuss further in Chapter 14. In 1885, an American geologist named G. K. Gilbert showed that such deltas contain three components (figure above): topset beds composed of gravel, foreset beds of gravel and sand, and silty bottomset beds. 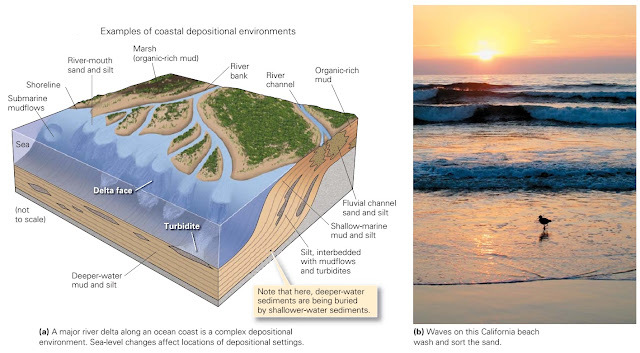 Along the seashore, a variety of distinct coastal environments occur; the character of each reﬂects the nature of the sediment supply and the climate. Marine environments start at the high-tide line and extend offshore, to include the deep ocean ﬂoor. The type of sediment deposited at a location depends on the climate, water depth, and whether or not clastic grains are available. After following the river downstream for a long distance, we reach its mouth, where it empties into the sea. Here, the river builds a delta of sediment out into the sea. River water stops ﬂowing when it enters the sea, so sediment settles out. Large deltas are much more complex than the lake examples that Gilbert studied, for they include many different sedimentary environments including swamps, channels, ﬂoodplains, and submarine slopes. Sea-level changes may cause the positions of the different environments to move with time. Thus, deposits of an ocean-margin delta produce a great variety of sedimentary rock types (a in figure above). Now we leave the delta and wander along the coast. Oceanic currents transport sand along the coastline. The sand washes back and forth in the surf, so it becomes well sorted (waves winnow out silt and clay) and well rounded, and because of the back-and-forth movement of ocean water over the sand, the sand surface may become rippled (b in figure above). Thus, if you ﬁnd well-sorted, medium grained sandstone, perhaps with ripple marks, you may be looking at the remnants of a beach environment. From the beach, we proceed offshore. In deeper water, where wave energy does not stir the sea ﬂoor, ﬁner sediment can accumulate. Because the water here may be only meters to a few tens of meters deep, geologists refer to this depositional setting as a shallow-marine environment. Clastic sedimentary layers that accumulate in this environment tend to be ﬁne-grained, well-sorted, well rounded silt, and they are inhabited by a great variety of organisms such as mollusks and worms. Thus, if you see beds of siltstone and mudstone containing marine fossils, you may be looking at shallow-marine clastic deposits. In shallow marine settings relatively free of clastic sediment, warm, clear, nutrient-rich water hosts an abundance of organisms. Their shells, which consist of carbonate minerals, make up most of the sediment that accumulates (a and b in figure above). The nature of carbonate sediment depends on the water depth. Beaches collect sand composed of shell fragments; lagoons (protected bodies of quiet water) are sites where carbonate mud accumulates; and reefs consist of coral and coral debris. Farther offshore of a reef, we can ﬁnd a sloping apron of reef fragments. Shallow-water carbonate environments transform into various kinds of limestone. We conclude our journey by sailing far offshore. Along the transition between coastal regions and the deep ocean, turbidity currents deposit graded beds. In the deep-ocean realm, only ﬁne clay and plankton provide a source for sediment. The clay eventually settles out onto the deep-sea ﬂoor, forming deposits of ﬁnely laminated mudstones, and plankton shells settle to form chalk (from calcite shells; a and b in figure above) or chert (from siliceous shells). Thus, deposits of mudstone, chalk, or bedded chert indicate a deepmarine origin.